This is a brand new add-on called 2 Player Horse Riding Add-On. This add-on lets two players ride a horse at the same time. Horses, but especially saddles, can be quite difficult to find early on in the game, so this makes horse riding a little bit easier. It’s also just looks very cool to have two players ride it at the same time. Enjoy playing! It’s the first player who rides the horse which will be the one who control it. The second player will be seated behind the first player, also on the back of the horse. You will need to get off the horse to switch places. Get ready with that bow to take down the enemy! 1. 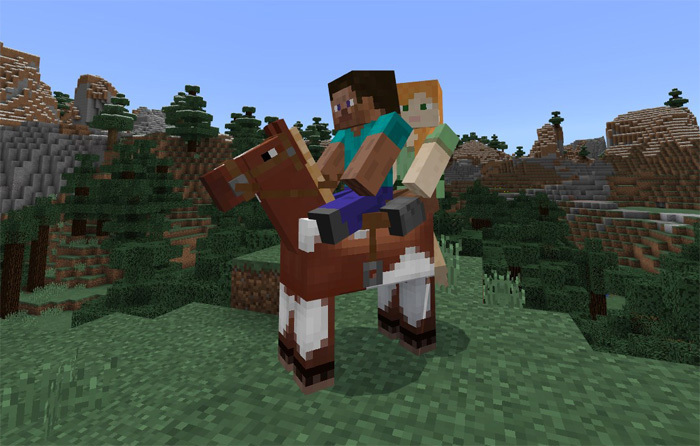 Download 2 Player Horse Riding Add-On here!